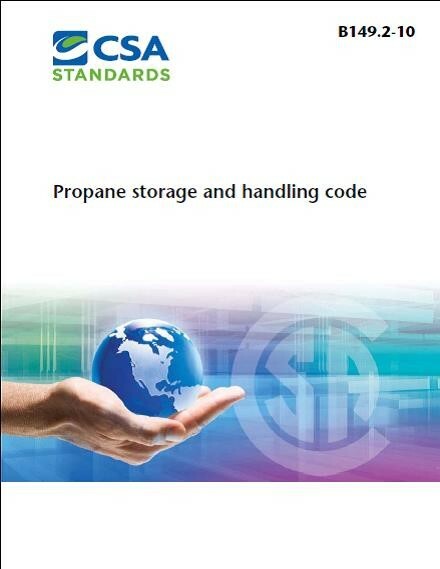 This article, related to Changes in 2015 Version of B149.2 Propane Storage & Handling Code, first appeared in the May/June 2014 edition of Propane Canada magazine and was updated in October 2014. In 2015, the Canadian Standards Association (CSA) will issue new versions of the B149 Codes scheduled for release by CSA in August 2015. The 2015 Codes are meant to replace the current 2010 Codes in use. For the propane technician working in the field, it can be a challenge to determine what has been deleted, added or amended, since the last Code was published. This article provides a summary of the clauses that have been amended, added and deleted in the CAN/CSA B149.2 Propane Storage and Handling Code. The 2015 editions of the Codes are the completion of a 5-year code cycle that CSA uses to keep the Codes updated to address new technologies, new installation materials, and changing building environments. The committees who update the codes also consider changes to improve the usability of the document. Many of the amendments consolidate subjects so that a gas technician has to only look in one place for the requirements of a specific component. For example, the requirements for appliance installation, regardless of where the appliance is being installed, home or RV, are now in the CAN/CSA B149.1 Natural Gas & Propane Installation Code instead of being split between this code and the CAN/CSA B149.2 Propane Storage & Handling Code. The adoption of the 2015 Code is done by each province and territory separately with some Authorities Having Jurisdictions (AHJ) adopting the Codes immediately, and others taking several years. A person must use the most current Code adopted in their Province or Territory for new or upgrading propane installations. In addition, each Province or Territory can, when adopting the Codes add, amend or delete clauses from the Code by way of their Code Adoption Document (CAD). Since this article was first published in Propane Canada magazine, the Technical Standards & Safety Authority (TSSA) issued an amendment to their Propane Code Adoption Document which is effective October 1, 2014. TSSA felt that new requirements in the 2015 version of the Code are considered important to be implemented in Ontario right away and addresses gaps in the current Code to enhance safety. In particular, the new requirements pertaining to cylinder use and storage at construction sites will become effective as of October 1, 2014. The following is a summary of revisions included in the 2015 edition of the CAN/CSA B149.2 – Propane Storage & Handling Code. The scope has also been amended to include maintenance as a requirement for containers and equipment to be used for propane at customer locations, in distribution locations, and filling plants. Item (j) of the exclusions was amended to exclude any equipment extending downstream from the inlet to any container pressure regulator, commonly referred to as the 1st stage regulator. The propane system downstream of the 1st stage regulator outlet is governed by the CAN/CSA B149.1 Natural Gas and Propane Installation Code. The rationale for this change was that regardless of who owns the propane storage container, the propane distributor or customer, the container must be maintained. Safety requirements for systems and components should not be different for various owners. Item (k) of the exclusions was also amended to exclude the installation of propane fuel system components and tanks on vehicles covered by CAN/CSA B149.5 Installation Code for Propane Fuel Systems and Tanks on Highway Vehicles. Section 3 of the Code provides definitions of terms used within the Code. A number of definitions were added or amended in the 2015 edition of the CAN/CSA B149.2 Propane Storage and Handling Code. A new definition for “Aerosol Container” was added which is to simplify parts of the Code and close the loophole created where restrictions are made on the manufacture, use or storage of TC 2P and TC 2Q specification aerosol containers. The same amendments are not carried over to include US DOT corresponding specification aerosol containers which are permitted by the TDG Regulations under specific conditions. New standards and specifications for aerosol containers under the TDG Regulations are planned. A note added to the definition for aerosol containers states that pressure limits on aerosol containers in the TDG Regulations (1245 kPa at 55°C for 2Q and 1105kPa for 2P) exclude the use of 2P and 2Q containers for pure propane. A new definition for “Connected For Use “was added to clarify whether or not cylinders that are properly connected to an appliance that is not running and which may or may not be turned on for use, are not in storage. Properly connected cylinders that remain connected for current, intermittent or future use, would not be subject to storage requirements. A new definition for “Construction Site” has been added to indicate that the handling of cylinders and propane apparatus in use or in storage at construction sites are subject to significantly differing situations. Definition of “container” was amended to remove reference to NGV. The term NGV (Natural Gas for Vehicle) is used many times in the B149.2, which is a code dedicated to propane. NGV references are now located in the CAN/CSA B149.1 Natural Gas and Propane Installation Code. Also, the definition was modified to include the aerosol containers. The definition for Container Refill Centre (propane service station) was amended to include “dispensing system” which is a new definition within the Code. New definition “Dispensing System” and an amendment to the definition of “Kiosk” was created to clarify confusion within the code regarding exactly what a “dispenser” is. As a result, the word is used in various contexts throughout the code. It is proposed to clarify the definitions of the various uses of “dispenser” and then incorporate these into the code as required. The definition for “Filling Plant (bulk plant)” was amended to remove the words “and” & “or” so that the definition now states that such plants have bulk storage or container filling or vehicle transfer facilities on the premises. The rationale provided stated it had recently come to the committee’s attention that there is a practice of transferring from rail cars to cargo liners, bulk trucks or other mobile storage vehicles, outside of a bulk plant. Presently there are no rules for how this is to be done in a safe manner. This proposed clause uses wording very similar to the accepted wording for truck-to-truck transfers since the two situations are somewhat analogous (see also revisions for 7.18.3). New definition “Dispensing System” and an amendment to the definition of “Kiosk” to clarify confusion within the code regarding exactly what a “dispenser” is. As a result, the word is used in various contexts throughout the code. It is proposed to clarify the definitions of the various uses of “dispenser” and then incorporate these into the code as required. The definition “Mass Gauge” was amended to remove the potential for the reader to conclude that there are no requirements for mass measurement gauges. New definition for “Propane Dispenser” as part of a series of definition amendments to clarify the definitions of the various uses of “dispenser” and then incorporate these into the code as required. The definition for “Refueling station” and “remote Dispensing Device” were deleted as they refer to natural gas installations, not propane. The definitions now exist in the CAN/CSA B149.1 Natural Gas and Propane Installation Code. The definition for “Tank” was amended to remove reference to tanks used for NGV installations. The original definition for “Tank Heater” has been amended as well as a new definition to take into account indirect and direct gas-fired tank heaters. There are several types of vapourizers defined in the Code. Not all vapourizers are appliances as defined under the term “appliance” in B149.2 section 3. Electric vapourizers, for example, do not convert LP-Gas to useable energy. They use electricity to convert LP-Gas from the liquid phase to the vapour phase. Meanwhile, all direct-fired vaporizers are considered to be appliances by their very nature. The amendments add a definition to clarify the term “direct gas-fired tank heater” which is used in section 9 – Vaporizers. The following describes the specific parts within Section 5 which have changed within the 2015 edition of the Code. This Clause is an exemption clause that exempts propane from being put into containers specifically designed for butane. The clause has been amended to provide the Transport Canada and CSGB Standards for cylinders that can be used for propane. This clause was amended to clarify what standard a cylinder used for propane must meet for it to be used for anhydrous ammonia. This clause originally restricted cylinders from being installed under any fire escape, stairway, or ramp used as a means of egress from a building. The clause has been amended to read “container” so the restriction applies to cylinders and tanks. As a result of this revision, Clause 6.5.13 was deleted. This clause specified that cylinders must be manufactured, tested, inspected, and marked in accordance with both CAN/CSA B339 Cylinders, Spheres, and Tubes for the Transportation of Dangerous Goods code and the TDG Regulations. The clause was amended to remove the TDG Regulations requirement so that the CSA is the prescribed standard to which cylinders must be inspected and qualified. The rationale for this amendment was that when a new edition of CSA B339 is published, the TDG Regulations and this Code may find themselves referring to different editions of CSA B339 potentially leading to confusion. This clause was amended to harmonize with US requirements. NFPA 58 -2008 states that cylinders with 4 lb. (1.8 kg) through 40 lb. (18 kg) propane capacity for vapour service shall be equipped or fitted with a listed overfill protection device; the current Canadian requirement starts at zero, not 4 lbs. (1.8 kg) as in the US. This clause has been amended to remove the previous requirements for the 10-year cylinder inspection and requalification from the Code. The clause now states that refillable cylinders shall not be refilled if they are due for requalification as prescribed by requirements of the CSA B339. In addition, the exemption for cylinders in excess of 240 lb (110 kg) water capacity with a protective dome cover not requiring PRV replacement was removed to be consistent with the requirements of B339. This means that all cylinders built to B339 standards must have the PRV replaced during the 10-year requalification period. This clause was amended to require that cylinders have a pressure relief valve installed that meets the requirements of CAN/CSA B340 – Selection and Use of Cylinders, Spheres, Tubes, and Other Containers for the Transportation of Dangerous Goods, Class 2. This clause clarifies requirements for storing cylinders. This clause was added to mirror the markings for a dip tube in CSA B339. This clause was amended to clarify that Specification TC-39M and aerosol containers cannot be filled. The clause deals with the number of aerosol containers and TC-39 non-refillable cylinders that can be stored in a dwelling. The clause was amended for correctness. This clause was amended to remove maximum temperature to which a cylinder can be exposed. The temperature requirement is now located in new Clause 6.1.16. This clause was amended to permit the storage of cylinders on roofs in accordance with Clause 6.5.3.9. This clause was amended extensively to update guidelines for cage construction to reflect current acceptable practices and to provide clear minimum design criteria that allow innovation. The changes also ensure only well-ventilated cages are used. The present location of the affected clause is under 6.5.2 Cylinders stored outdoors for commercial or industrial use or sale; however, propane cylinders can be placed in cabinets or other containers on many other sites. Therefore in addition to providing guidance on how to properly construct just industrial and commercial cabinets, the clause will now have an effect on any storage cabinet housing propane. As a result of the amendments to Clause 6.5.1.15, Clause 6.5.2.4 was deleted from the Code. These clauses have been added to address any confusion regarding the sighting and signage requirements for cylinder exchange equipment. Over the last ten years, there has been a rapid increase in the use of LP-gas cylinder exchange stations for consumer propane tanks. The next step of providing better accessibility to propane tanks was the introduction of automated exchange machines. The code needed to address the requirements for automated exchange operations. The new requirements also address risks associated with the absence of the attendant so that automated operations can be conducted safely. The Clause wording is consistent with the National Fire Code proposals and NPGA dockets. This section, which addresses cylinders not connected for use at construction sites has been extensively amended to clarify acceptable “outdoor” storage by identifying proper and safe storage options that reflect conditions on construction sites. It is based on the hazards rather than focusing on the location alone. This clause has been amended to address specific requirements for cylinder storage on construction sites which also address worksite hazards. This new clause provides the requirements to be followed on construction sites when moving cylinders between floors and the storage of cylinders on roofs. This clause has been amended to require that non-refillable cylinders be packaged in accordance with CSA B340 and marked in compliance with the provisions of the CSA B339. Transportation of cylinders has had a note added to the beginning of the Section stating that the transportation of propane falls under the TDG Regulations and that activity under the TDG Regulations must be satisfied when transporting cylinders. Deletion of Clauses 6.6.2 through 6.6.7. The requirements for protection of valves are prescribed in detail in Clause 4.2.2 of CSA B340-08. The clauses were deleted to avoid overlapping and potentially conflicting requirements. This section has been amended to have propane cylinders installed on the uppermost flat roof of a building. This amendment addresses cases where a housing building is in the shape of a stair, where the roof of one level is a terrace for the level above. Being on the roof of a typical building, in the case of a fire, no one has to cross the level where the cylinders are installed. This level of protection and isolation is lost in the case of a step-shaped building. The table was amended to delete the 20 lb. maximum cylinder size that may be stored at a cylinder exchange. The rationale provided is that due to a demand from RV customers, 30 lb. cylinders are being offered at exchange locations and that the safety concerns of 30 lb. cylinders are not different from those of 20 lb. cylinders. Maintaining the cabinet maximum capacity of 500 lb. (25 x 20 lb., or 16 x 30 lb., or combination thereof) maintains the same risk and requirements of a single full exchange cabinet. These tables were amended to clarify the volume of propane in non-refillable cylinders that can be stored in retail locations. The changes replace each phrase “net weight of cylinders” in tables 6.4 and 6.5 with “quantity of propane”. In addition, Table 7.5 (Location of Tanks at Filling Plant and Container Refill Centres) was amended in the 2015 edition. When the liquid connections of horizontal or vertical tanks are manifolded together, the tops of the tanks shall be at the same horizontal level. Tanks that have liquid interconnections shall be installed so that the maximum permitted filling level of each container is at the same elevation. Vertical containers used in liquid service shall not be manifolded to horizontal containers. Vertical containers of different dimensions shall not be manifolded together. This revision addresses the concern that when two horizontal tanks are connected together by a common liquid line there may be instances when the larger of the two tanks is overfilled when the top of these tanks are not at the same horizontal level. This clause requires that any line utilized for product flow must have a flow capacity greater than the rated flow of the excess flow valve protecting the line. A note was added to the clause recognizing that non-metallic tubing installed between metallic piping and an underground tank is acceptable as a dielectric joint. When a non-metallic line is used (typically polyethylene tubing) between the first stage regulator at the tank and the second stage regulator attached to a building there is no function served in using a dielectric union or other isolating fitting, because the polyethylene tubing is non-conducting and serves the purpose of isolating the tank and its fittings from the metal components of the building. This clause has been amended to provide clearances for underground propane tanks with a capacity of 2,000 USWG or less from the building, property line, other underground services, and tanks. This clause provides underground clearances for tanks greater than 2,000 USWG. This clause now permits the discharge of a safety relief valve and other vent devices or lines to be vented within the dome, housing or curb box on underground propane tanks with a capacity of 2,000 USWG or less. This clause has been amended to allow manifolded tanks with a capacity less than 125 USWG (475 L). The aggregate capacity is not used when determining separation distance to an important building, a group of buildings, or line of adjoining property that can be built upon. The largest single container in the manifolded system is used to determine the clearances required in Table 7.4. This clause has been amended to remove the word “aggregate” from the clause. This provides clarification around the clearances required for tanks manifolded together to make a system as allowed in 7.10.2. This addresses issues in metropolitan areas where the 10-foot clearance to property lines cannot be met. Currently, on a bank of four 123 USWG (454 L) tanks technicians are basing their tank sets on the aggregate capacity of over 125 USWG (475 L) up to and including 1000 USWG (3800 L). This clause addresses the transfer of propane at a filling plant from a railcar to tank truck, tank trailer or cargo liner. The clause requires that Clauses 7.12 to 7.18 and 7.19.4 be met and that the approval of the authority having jurisdiction is needed. The clause addresses the issue of transferring from rail cars to cargo liners, bulk trucks or other mobile storage vehicles, outside of a bulk plant. The clause uses wording very similar to the accepted wording for truck-to-truck transfers since the two situations are somewhat analogous. It should be noted that there could be confusion in terms of which authority has jurisdiction – the local Authority or Transport Canada since the unloading of railcars typically falls within the jurisdiction of Transport Canada. This clause permits the use of barriers other than those listed if it can be demonstrated that they provide an equivalent level of protection. This clause has been amended to permit additional methods to protect remote dispensing devices. These new clauses prescribe operations and maintenance procedures. The purpose of the new clauses in the code is to provide a minimum standard for the operation and maintenance of propane facilities and equipment. The new clauses apply to tank systems, filling plants, container refill centres and other facilities where liquid propane is piped to a vapourizer or process. Because there are many variables, it is not possible to prescribe a set of operation and maintenance procedures that will be adequate from the standpoint of safety in all cases, so the new clauses establish a baseline or minimum standard. This table has been expanded to provided distances for tanks up to 90,000 uswg. The rationale for this expansion is that with installations over 10,000 USWG, the local authorities use the table in the NFPA 58. This change is to provide the tool to the local authorities and to harmonize minimum distance requirements with NFPA 58. A note has been added to this clause to explain that the requirements for design, manufacture, repair, inspection, test, marking, selection, and use of tank trucks, tank trailers, cargo liners, and portable tanks for transporting propane are prescribed by the Transport Canada’s Transportation of Dangerous Goods Regulations. Coastal and island delivery where barges are used to transport propane bulk trucks to customer sites. Bulk trucks are refilled without being removed from the barge. Delivery of propane to wellheads where the rugged terrain prevents highway bulk trucks from traveling directly to the propane tank locations. Bulk trucks specifically designed to handle the terrain are refilled by highway bulk trucks. Delivery to logging camps and asphalt plants within the interior at certain times of the year requires that truck to truck transfers take place between the highway bulk truck and bulk trucks designed to travel rough unassumed interior roads. This new clause allows the content of a rail car may be transferred to a tank truck, tank trailer or cargo liner other than at a filling plant when approved by the authority having jurisdiction. It should be noted that the code refers to the provincial regulator, not Transport Canada, who actually has jurisdiction over this practice. The clause was deleted since the requirements for the operation of highway tanks (tank trucks, tank trailers and cargo liners) are within the scope of the TDG Regulations and included in CSA B620, CSA B621 and CSA B622 for all highway tanks. This clause requires that a tank truck, tank trailer, or cargo liner used for storage comply with Clause 7. The new clause addresses safety issues associated with parking of vehicles carrying propane for longer periods of time. This clause, which dealt with repair work performed on a tank or tank equipment of a tank truck or cargo liner was deleted since the repair work is governed by TDG Regulations. This clause requires that an emergency shutdown system must be installed in any tank system supplying propane to direct-fired vapourizers. This clause has been amended to require the heating medium piping for an indirect vapourizer to be provided with backflow preventers and phase separators to prevent the flow of propane into such piping. This clause stipulates that if the heat source of an indirect-fired vapourizer is a source of ignition, is not certified for hazardous locations, and is located within 15 ft (4.5 m) of the vapourizer, the vapourizer and its heat source must be installed as a direct-fired vapourizer. These clauses support the new definitions of vapourizers. These Clauses provide further constraints around tank heaters while also specifying the proper requirements for safe installation and use of acceptable types of tank heaters. Section 11 of the Code describes the requirements related to the installation of appliances, equipment, and containers on highway vehicles, recreational vehicles, mobile housing, outdoor food service units, and wash-mobiles. Most of the sub-sections and clauses in this Section have been deleted in the 2015 version of the code. These sub-sections and clauses have been moved to either the CAN/CSA B149.5 – Installation Code for Propane Fuel Systems and Tanks on Highway Vehicles code or CAN/CSA B149.1 – Natural Gas and Propane Installation Code. This section will also be renamed to “Installation of equipment, and containers on highway vehicles, recreational vehicles, outdoor food service units, and wash-mobiles”. The remaining sub-sections and clauses will be renumbered in the 2015 edition of the code. This article, related to changes in 2015 version of B149.1 Natural Gas & Propane Installation code first appeared in the March/April 2014 edition of Propane Canada magazine. It was updated in October 2014. This article provides a summary of the clauses that have been amended, added and deleted in the CAN/CSA B149.1 Natural Gas & Propane Installation Code. The adoption of the 2015 Code is done by each province and territory separately with some Authorities Having Jurisdictions (AHJ) adopting the Codes immediately and others taking several years. A person must use the most current Code adopted in their Province or Territory for new or upgrading propane installations. In addition, each Province or Territory can, when adopting the Codes add, amend or delete clauses from the Code by way of their Code Adoption Document (CAD). When inspecting installations one must use the Code in existence at the time the installation was installed as Codes are generally not retroactive. It is important to remember that an existing propane installation is considered to be in compliance if it still meets the requirements of the Code at the time of installation. It is, therefore, crucial that the gas technician not only has the latest edition of the Code and current provincial regulations but access to previous Codes for reference when inspecting existing installations. The following is a summary of revisions included in the 2015 edition of the CAN/CSA B149.1 Natural Gas & Propane Installation Code. Section 2 of the Code provides a listing of the supporting codes and publications referred to within the CAN/CSA B149.1 Natural Gas & Propane Installation Code. The following provides information related to references that have been changed or added. The code accepts the ANSI/LC-4/CSA6.32-2012 Press-Connect Metallic Fittings for Use in Fuel Gas Distribution Systems Standard to permit the use of press-connect metallic fittings for use on natural gas and propane systems. The standard was originally developed for copper metallic press fittings but in 2012 the standard was revised to include other metallic materials (copper, carbon steel and stainless steel). Section 3 of the Code provides definitions of terms used within the Code. A number of definitions were added or amended in the 2015 edition of the CAN/CSA B149.1 Natural Gas & Propane Installation Code. An appliance intended to supply hot liquid or vapour for space-heating, processing, or power purposes and does not include appliances certified as water heaters. The definition was changed to exclude appliances certified as water heaters. A system or device used in common venting of positive pressure appliances to prevent the exhaust flue from active appliances sharing the system from flowing back into the vent of dormant or idling appliance(s). This definition recognizes check valve technology developed to prevent flue products backflow issues. Permanently installed appliances where the gas connector is designed not to be repeatedly moved or disconnected/connected to the piping system. Movable appliances where the connector is designed for repeated movement and disconnects or reconnection. Gas connectors for outdoor use. Quick disconnect devices or gas convenience outlets. A permanently mounted certified hand-operated device that provides a means for connecting and disconnecting an appliance to the gas supply piping by way of a gas hose or gas connector. The new definition recognizes that a direct gas-fired air heater may be capable of either ventilation mode, to off-set building heat loss; or process mode, intended for drying, baking or curing product; or both operating modes. Adhesive tape made of PVC or polyethylene material with a minimum thickness of 10 mil (0.25 mm), with an adhesive resistant to water. The definition explains what is considered to be acceptable wrap since field inspection continues to find unacceptable pipe wraps such as duct tape and thin, low-quality electrical tape being used in the applications addressed by the two subject clauses. The definition was expanded to address a disconnect device equipped with an automatic means to shut off the gas supply when the device is disconnected and is certified to ANSI Z21.41/CSA 6.9. This Section was transferred from the CAN/CSA B149.2-10 Propane Storage and Handling Code. It provides a single source for appliance and gas system installations regardless of installed location. Recognizes engineered appliances that are used in hazardous locations that are not certified, but field approved. To address the odourization of natural gas from private natural gas wells where it is used for fuel purposes supplying an occupied building. This Section was transferred from the CAN/CSA B149.2-10 Propane Storage & Handling Code. It provides a single source for the installation of appliances regardless of their installed location. As currently written, the code suggests that it would be impossible to use natural gas in a building under construction. To be consistent, a value for the natural gas was inserted in the last row of Table 5.1 – Pressure inside buildings. Two clauses dealing with regulators installed on vehicles from CAN/CSA B149.2-10 Propane Storage & Handling Code have been transferred to this Code so that all requirements for regulator installation are in a single source regardless of installed location. To recognize fittings manufactured to ANSI-LC-CSA 6.32. To recognize the use of press connection joints. To clarify how an appliance is to be connected to the gas piping system; addresses the use of corrugated stainless steel tubing (CSST) systems and tubing system installations and recognizes the use of gas convenience outlets. To recognize the use of press-connect fittings on underground piping and tubing systems. To address the contact of metallic gas piping with a pipe of a different material which can result in galvanic corrosion. To add the definition of “pipe wrap tape”. Clarifies that all piping/tubing needs to be identified; not just indoor piping/tubing systems at care, detention, occupancy, commercial, industrial, and assembly buildings. Added wording to clarify that a manual shut-off valve must be certified for its intended purpose and rating. Permits the use of a gas connector certified to ANSI Z21.101/CSA8.5 for connecting ranges, refrigerators, and clothes dryers to the building piping. Transfers clauses dealing with hoses transferred from CAN/CSA B149.2-10 Propane Storage & Handling Code to this Code to provide a single source for the installation of hoses. The clause related to venting and air supply excludes Clause 8.5.4 from the requirements to provide consistency of intent. This clause, related to stationary engines and turbines, recognizes ANSI Z21.21/CSA 6.5 C/I for safety shut-off valves and to permit the second safety shut-off valve to be installed upstream of the appliance zero governor type regulator. Clarifies that a furnace must be installed on a firm level base. Changes the requirement to not leave a torch unattended to apply to both natural gas and propane. The clause, related to direct-fired door air heaters, addresses the installation of refurbished used direct-fired door heaters that were originally certified to withdrawn Standard CGA 3.12 or CAN 1.3 12-78. There is a used market for these heaters and they can still be functional, if well maintained, after 30 years. Because of this used market, they will often be installed on renovations or new projects. This clause related to non-recirculating direct fired industrial air heaters was the result of editorially separating current clause 7.21.2 into two separate clauses and revise the numbering accordingly. Ensures that outside air dampers or closing louvers not certified as an integral part of the appliance are interlocked so that the main burners do not operate until the air dampers are fully open. Clauses were added to address the installation instructions for refurbished Direct Gas-Fired Process Air Heaters, which have not been manufactured since 2002. The clause addressed minimum access clearance to the water heater burner. The present accessibility section and manufacturer’s instructions were deemed adequate. Changes address return air inlets in combo heating systems. The present clause was found to be confusing and was rewritten for clarification. Clarifies that an outdoor air supply to an enclosure can be sized using either table 8.3, for appliances having draft control devices; or table 8.4 for appliances not having draft control devices. Ensures a combustion air supply device has air flow proving interlocked to the appliance(s) served and sufficient airflow is demonstrated. The clause, related to air supply was found to be confusing and was rewritten for clarification. Provides requirements for common venting of appliances with positive pressure venting. Check valve technology has been developed to prevent flue products backflow issues. This venting technology is currently permitted in Europe. For vents and chimneys serving two or more appliances, a note was added to explain differences between common venting of Category 1 & 11 appliances and Category 111 & 1V appliances.